Quadcopters are highly in demand from toy stores and online retailers, and sales are expected to remain hot through 2018. Frustratingly, one of the complaints of many drone enthusiasts is that there aren’t enough locations to fly them. That’s why mini quadcopters are highly desired, as they can be pilotted in the comfort of your own home. You can fly them in the living room, basement, or back yard. Mini quadcopters are small and compact, usually around the size of an adult’s hand or smaller. Most will fit comfortably within the palm of a hand. These mini copters are small, so they’re safer to fly around pets and younger children. Many come with blade guards so you don’t have to worry about scratching up your furniture or your walls. The easiest places to fly a small quadcopter are usually around a yard, or in the basement of a home. The more room, the greater you’ll experience the full power of a quad. Many modern offices today also buy a micro quadcopter for the use of their staff. Besides being small and compact, flying small quadcopters can be great fun. Since they require so much of your attention, mini quadcopters a nice way to relax and unwind near the end of a long week. When you’re shopping around for the best small quadcopters you’ll find that there are dozens of choices. Be sure to choose a name brand micro quadcopter, rather than a cheap knockoff from China. You’ll find that these knock-offs may be cheap, but they just don’t fly properly, and usually run off on their own. You don’t want to lose your investment before you’ve even had a chance to learn how to pilot the best mini drone. Five of the best mini drones today are made by the Holy Stone, Cheerson, Syma, Hubsan and UDI lines. You’ll find that many of them share the same sets of characteristics, so you’ll want to compare their differences. Some have a built-in camera, while some don’t. 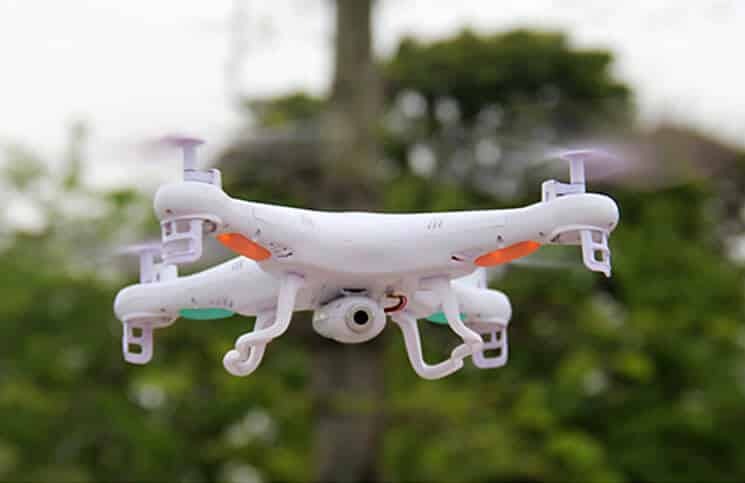 You’ll have to decide if you prefer to have a best mini quadcopter with advanced flight control systems to help the beginner, or whether taking video is more important. Check out the wonderful features on each of these best mini copters to see which one will work well for you. The Holy Stone HS170 is the perfect mini drone for those who want a cool-looking quad that has a hi-tech appearance that looks less like a toy. 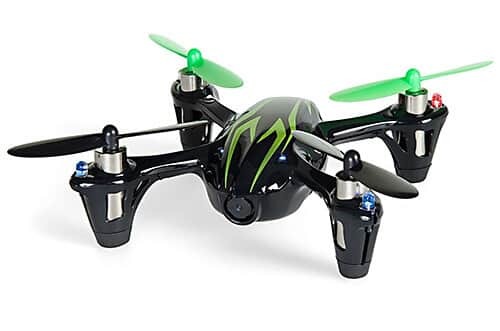 This quadcopter mini has an attractive blue and black body with two black rotors, and two white, with four black rotor guards to prevent damaging walls, furniture, or landscaping. The Holy Stone HS170 is perfect for new mini copter pilots who are looking to learn how to pilot a quad. It’s affordably priced at around $40 to $55 and is perfect for any level of drone pilot. One great option in a mini quadcopter is the headless security system. A headless system will allow your quad to fly in the direction you are aiming your controls, regardless of whether its front orientation is pointing forward or not. This prevents losing the quadcopter, as sometimes the beginner pilot may have difficulty turning their toy to face forward. The headless system is a nice feature to have. 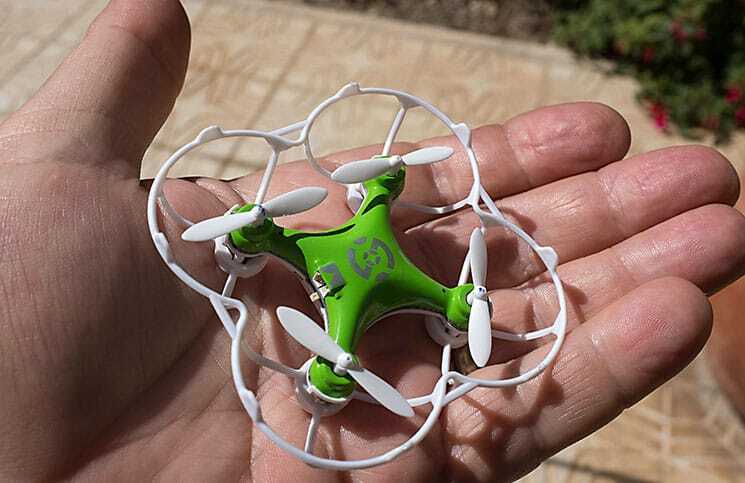 Other great features of this mini copter include 2.4 GHz technology for anti-interference. 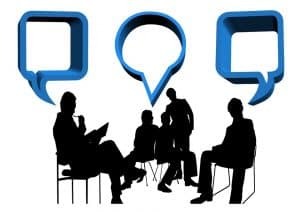 You can buy more than one and your family can fly them around yard or recreation room without having them interfere with each other. The Holy Stone HS170 is built with a six axis gyro system that enables perfect stabilization in the air. There will be no worries that your flying will be erratic. This mini quad copter will fly out to a range of about thirty to fifty meters. After one full charge, which takes about thirty to forty minutes, you’ll be able to send your Holy Stone on flights for about six to eight minutes. Included in the box is a USB cable for recharging. This best small quadcopter only weighs 14.4 ounces and measures only 5.3 x 1.6 x 5.3 inches. Another great mini quadcopters for sale is the Cheerson CX-10C. This is the latest offering in their CX mini quad copters line. Previously we saw the Cheerson CX-10 with their multitude of drone colors. 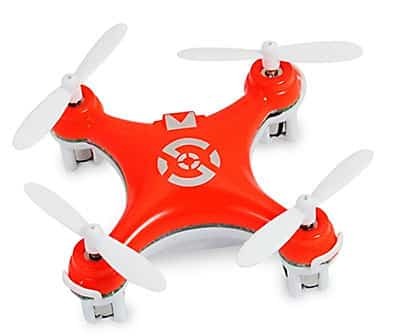 The Cheerson CX-10C is a mini quad that is sold in a black and white color, or orange and white, and it includes a built-in camera for extra fun in the back yard. The drone pilot will find that the Cheerson is one of the top mini drones for sale. It’ll be easy to learn how to fly until you get the hang of quads and want to buy a higher end model in the Cheerson line. The CX-10C has a radio controller that runs on a frequency of 2.4 Ghz. It has four channels so you can fly up to four drones at the same time. The Cheerson utilizes the same six axis gyro technology that most drone manufacturers boast about. As with other quads in this class Cheerson also utilizes the six axis gyro control system. It features adjustable gyro sensitivity so that you can focus on flying, and not worrying about whether you’re going to crash your toy or not. The CX-10C mini copter has LED running lights so you’ll be able to see your quad in dimly lit rooms or outside at night time. it takes about twenty-five minutes to charge up this micro quadcopter. This gives you about 2.5 to 4 minutes of flying fun. Enthusiasts can fly this small quad copter out to a distance of 15 to 30 meters. The Cheerson is made from ABS plastic materials, and it measures about 62 x 62 by 20 millimeters. It weight only 15 grams. Each of the blades measure 30 millimeters in length. The camera is 0.3 megapixels which is perfect for fun, but not for taking professional quality images. The camera will snap both photographs and videos. You’ll need to purchase batteries for the radio control unit, a memory card for the camera, and a card reader. When you’re hunting around for the best mini drones for sale, the Syma X12 is another micro quadcopter worth taking a closer look at. This quad is available in a basic white plastic casing with two white and two black blades. You have three other color choices as well: black, green, and red. It also has two red and two green running lights, so you’ll be able to see your quadcopter at a distance, or at night time. There are four guards to protect each of the blades from damage, or from having them damage walls or furniture. The beginner will find that this is one of the smaller quadcopters. They’ll find that it’s easier to fly and that perfect for beginners. The Syma X12 includes the stable flight system, enabling even a beginner to keep it soaring through the air. The Syma X12 is built with a six axis gyro direction stabilizer. This is one of the latest flight control systems today, and it has a 3D lock. It’ll enable you to keep your drone in the air, without having to worry that it might crash. It takes about fifty to sixty minutes to charge up the Syma X12, which gives you about six to eight minutes of flight time. This is actually fairly impressive in a drone of this class. With the eversion switch you’ll be able to do some great rolls through the air with the Syma X12. The remote controller runs on 2.4 gigahertz technology, and has four channels, so up to four drone toys can be flown nearby without fear of interference from each other. The radio controller will enable you to control this smallest quad copter with accuracy, through the use of left and right fine tuning switches. The small radio controller comes in a white plastic case with red switches. The Syma measures 7 x 4.5 x 2.7 centimeters. It costs around $20, making it an affordable toy drones on the market today. 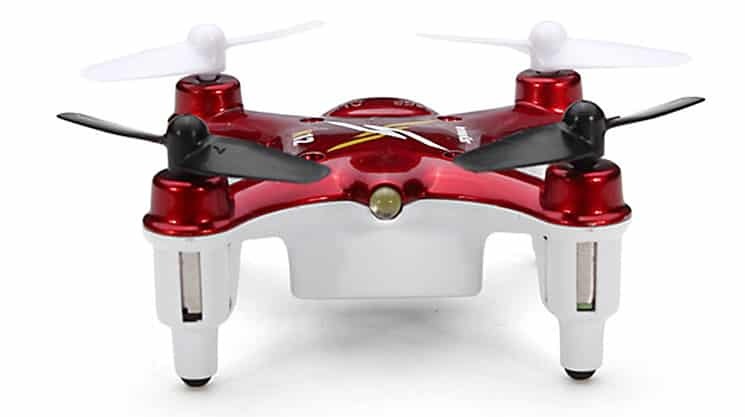 When you’re searching for mini quadcopters you’ll need to check out the Hubsan X4 H107C. It may be the best mini drone for you. The Hubsan is approximately the same size as the other nano quads. The Hubsan has a six axis flight control system with an adjustable gyro for extra sensitivity. You’ll s that the Hubsan soars smooth and stably through the air. The frame on the Hubsan is lightweight, and the protective guard provides exceptional durability, even when you may just be learning how to fly a drone for the first time. The Hubsan has four rubber feet to enable smoother landings. You may have difficulty choosing which color combo to buy. You have three choices: The black quad with red graphics and two black and two red blades; the black drone with green graphics and two black and two green blades; or the red casing with grey graphics and two black and two white blades. The Hubsan X4 H107C has four green running lights so you can see it better in the distance, or at night. It has a separate radio controller that utilizes the latest 2.4Ghz four channel technology. Another great thing about the Hubsan is that it’s sold with a built-in camera so you can film some neat video footage. This just adds to the fun of your smallest quad copter, and you can upload the footage to your computer and share with friends and family. The camera is high definition and 720px480p Cemare. You’ll be excited to film videos. The box doesn’t include a Micro SD card, so you’ll need to purchase one on your own. The radio controller is in a black plastic casing and looks a bit different than your standard controller. It has two elongated ends so you can hold it in your hands much easier. There are two joysticks that are reminiscent of traditional controllers, and a small LCD screen so you can see which level you’re flying in. There are trim buttons on either side and below the joysticks. The radio controller runs on four channels so several drones can fly in your yard at the same time without interference from each other. This Hubsan X4 H107C weighs only 50 grams. It charges up with the included USB charger cord. You can charge your drone up through your computer. One charge will last you about seven minutes. You can fly your drone out to a distance of one hundred meters. The small quad measures 70 by 70 millimeters. UDI makes some of the best mini quads for sale, so take a look at the UDI RC U839. It’s a small quadcopter that you’ll find is not only lightweight, but also easy to fly. It comes with its own nano-sized remote controller. UDI promises that while their drone is tiny, it’s built with fun and exciting features that are comparable to other larger drones, but is still be fun to fly. The UDI is suitable for piloting around the yard, in the park, in the forest, and indoors too. There is an option for indoor hovering, as you won’t be able to fly it out to farther distances such as if it were outside. The U839 is available in three different color choices. You can choose from black with neon green highlights and two black and two green blades; orange and black; blue and black; or magenta and black. It’s easy to change the blades if they become damaged. You’ll be able to take your UDI right out of the box and charge it up for play. You won’t have to install anything except batteries. The quad has LED running lights so you can fly it in dark lighting conditions or at night time. The radio controller utilizes lithium ion batteries. It has a unique feature where you can swap out the batteries and enjoy double the flight time. Often in these smaller drones shorter flight times are a concern as you’ve just gotten onto the flying field, and then discover that it needs to be charged up again! It can be annoying, but when you swap out a battery pack, that will enable you to get double or triple the enjoyment. The radio controller has 2.4 gigahertz technology, with four channels enabling multi-player use nearby. The radio controller unit is basic, but easy to use. Don’t expect to have traditional joy controls on this unit—they’re more like flat topped buttons that you push around to pilot your drone. The controller is compact and with black and bright green buttons. It’s equipped with the latest six axis gyro system with 3D lock. The UDI quad can do amazing 360 degree flight rolls with the press of a button. There are beginner and expert flight modes so you can start out slow, and then advance up as you become more experienced with drone flight. You can choose from different controls for trim, flight mode and power on. The blades in this small quad copter are built to be flexible. This means it’ll take the bumps and knocks that the starter may unwittingly do as they learn to fly. But no worries, the blades will bounce back into position, being resistant to bumps and crashes. It can be charged up through the included USB cable. One full charge will give you about five to six minutes of flying time before you need to plug it in again. This small quad measures 89 x 89 x 29 millimeters and weighs only 19.5 grams. Which Mini Quadcopter Is Perfect For You? These are five of the best mini quadcopters for sale. You’ll be able to find them in stores or from online shops. Each of these five small quadcopters have most of the basic features, and are very similar to each other. Most can do tricks and 360 degree rolls, while a couple of these choices come with a camera. While these types of quads take acceptable photographs or videos, but will likely not be suitable for professional use. For that you’ll need to purchase a full-size pro-style drone in the Parrot line. But the best news is that it’s easy to learn how to fly a mini quadcopter and then choose an expensive full-size drone after you’ve become a flying pro. Best of all, each of these nano quads in the Holy Stone, Cheerson, Syma, Hubsan and UDI lines are all extremely affordable, so should you decide to try out two or three, you’ll still have plenty of cash left over for your next purchase. Because with flying quadcopters—you will feel the urge to buy more than one!